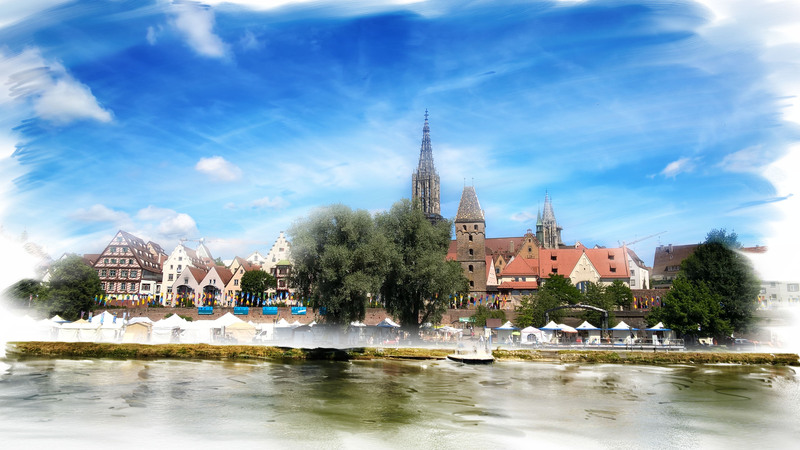 This charming festival takes place on both banks of the Danube which is here a rather narrow river (for us Viennese). Two riversides – in this case it means two Bundesländer. 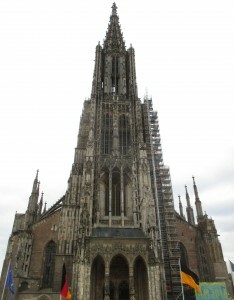 In the north, Ulm with its cathedral belongs to Baden-Württemberg, and in the south, Neu-Ulm is part of Bavaria. Which is reflected in politics and administration: Baden-Württemberg is governed by the Green Party and the Christian Democrats, Bavaria by the extremely conservative Christian Social Union (who pretty often act as pain-in-the-neck to poor Angela Merkel, e.g. concerning refugees). Locals complain this can also be seen with the penalties you get for ignoring car parking rules or for entering the town without a green pollution control label. Bavarian police will fine you quickly and relentlessly (and you pay more than in Ulm). Anyway, Hotel Palindrone succeeded in having no problems with the police on either sides of the river and enjoyed the multi-cultural atmosphere of an out-standing event. Music from classic to rock and world, theatre, Dance, exhibitions and of course the culinary highlights of the Danubian region from Central Europe to the Black Sea. 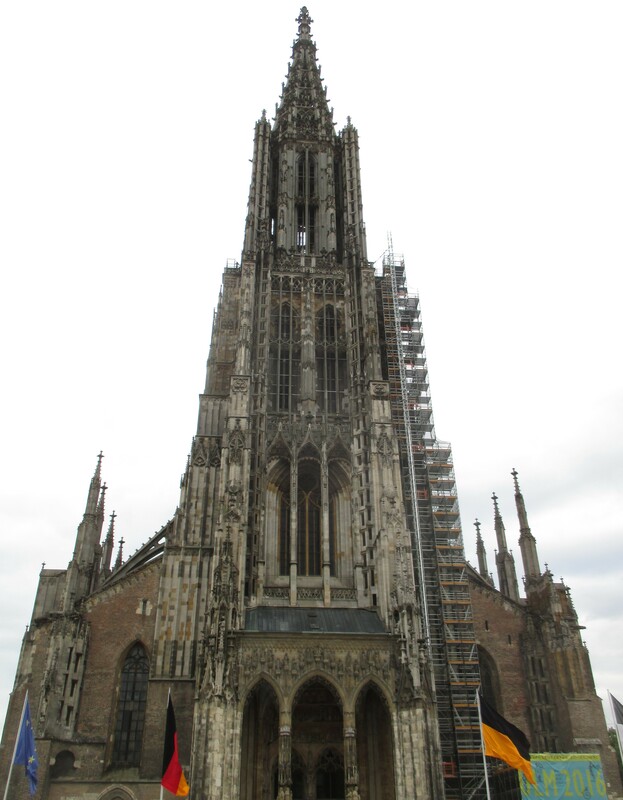 Let us return to Ulm Minster, the dream cathedral of all record-fetishists, as its tower is the highest medieval building of the world (162 meters). From outside, the rest of the cathedral does not look that impressive. 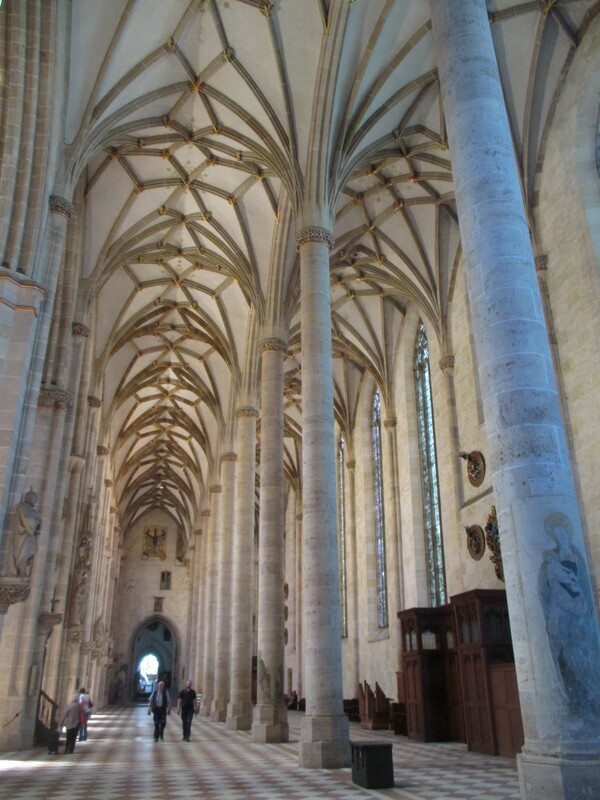 Unfortunately travel guidebooks usually forget to mention the effect when you enter the church: The nave and the side aisles seem to float weightlessly providing the interior with bright light. Inside, the Minster appears much bigger and wider than outside. You will find this paradox also with the Cathedral of Vézèlay in Burgundy. What we should not forget to mention: Albert Einstein was born in Ulm. Possibly he would be surprised by the relativity of police-behavior in the Danubian twin-cities. 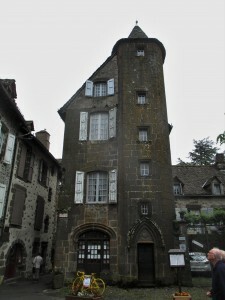 Puy Mary, Puy Violent, Puy de Dôme. These volcano peaks covered with grassland are well-known as a spectacular setting of the Tour de France. 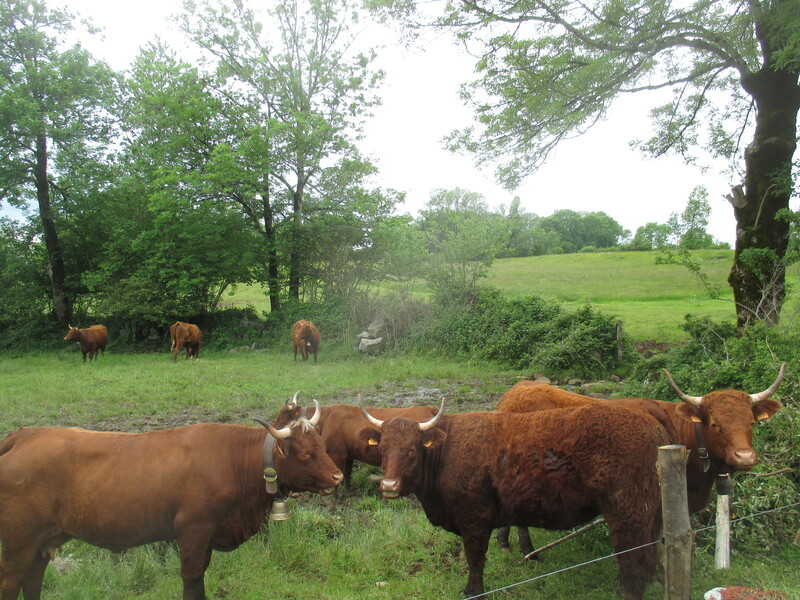 Maybe gourmets will associate this region with flavorful Cantal cheese and its milk providers, namely the Salers cattle which are considered bold, independent and smart. Veritable dare-devils, the local people proudly say, cognac-coloured with impressive long horns. From far away you can see them as red-brown dots zigzagging the intensive green of the mountain slopes around the medieval town Salers. Quasi roaming landmarks of Auvergne. Folk music may be regarded as another distinguishing mark of Auvergne: Bourrées, waltzes, scottishes, polkas and cercles. Dance tunes traditionally played on the bag pipe and the hurdy-gurdy, which were replaced by the violin and accordion in the early 20th century. It was the 1970ies-folk-revival that initiated a renaissance of the cabrette and vielle à roue. Hotel Palindrone appeared twice: A concert next to the fortress-like gothic cathedral Saint-Pierre and a balfolk at the Allée Georges Pompidou. As so often in Palotian history the musicians had to brave the attraction of football matches (in fact, every two years in June and July. See Palotika 2014: “The Palotians defy Rooney and Soàrez”). 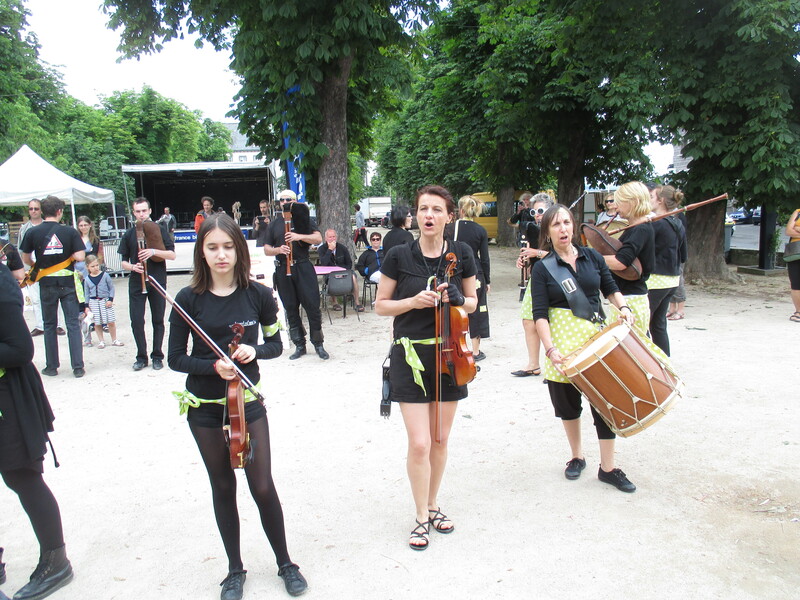 In Saint-Flour the music fans by far outnumbered the soccer freaks. Listeners respectively dancers enjoyed the shows, and nobody thought about the European Championship (which shocked John, the band’s kicker). Consequently, after the second gig it was not easy to find a pub with a TV-set to watch the match Belgium against Hungary. Finally, let us glance at the band’s ballestric-musical past: The first teams we had to cope with were the Netherlands and Croatia (World Cup 1998). A legendary act of Palotian gallantry, because after a thunderstorm had caused a 99-percent-absence of audience at the Open Air Gorizia (Italy), we escaped from the unsheltered stage to a bar tent where ten soaking music fans chattered their teeth in front of a video screen. With our instruments we added some warmth and an unusual sound track to the dramatic match. Which could not prevent our favorites, the Dutch, from losing. When Marialena Fernandes and Hotel Palindrone met for the first time, they would not have guessed how far their voyage would carry them – musically and geographically. No later than the concert at the Vienna Musikverein on the occasion of the Haydn Year 2009 they decided to continue their cooperation. Classical music and traditional European folk: The quintet (at the beginning calling themselves Hotel Haydn) quickly developed a fascinating sound pattern fusing musical genres which, at first sight, seemingly do not fit together: Bach, Scarlatti, Haydn, Mozart, Bartók. 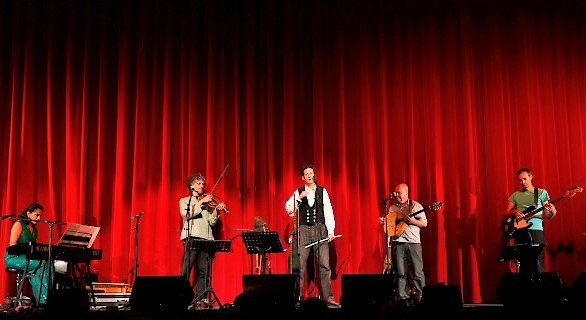 Traditional music from the Alps to Scandinavia, from Galicia to the Balkans, from Brittany to the Apennine. Original compositions oscillating between classical music, jazz, rock folk and world music. The pianist and the five multi-instrumentalists fell back on classical composers in order to highlight a very special aspect: Joseph Haydn & Co as world musicians who picked up musical elements where ever they came from. They did not shy away from traditional folk music and the pop culture of their times. The same holds true for dances and songs from other ethnic groups or social classes. When the musicians had to pick the composers for this album there was no need for long discussions. Their choice was Domenico Scarlatti, Joseph Haydn and Béla Bartók. Why them and not Mozart, Schubert, Beethoven or Liszt who have found their way into the quintet’s concert repertoire? 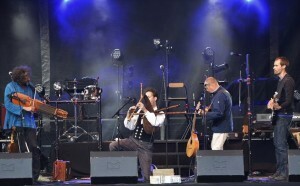 Marialena and the Palotians think the selected composers can be considered the grandmasters of contemporary “crossover” or “trans-cultural music”. Joseph Haydn grew up in Lower Austrian Rohrau – next to Slovakian, Hungarian, Croatian and Gipsy villages. Thus he was familiar with the dances and songs of “the others”. An influence which runs like a golden thread through his oeuvre. Be it an Ongarese or a Zingarese, or one of the leitmotifs in the London Symphony Nr.104, a Croatian folksong called Oj Jelena. But as a composer and collector Haydn went far beyond his multi-ethnic native country. During his stay in England he edited more than four hundred English, Welsh and (above all) Scottish folk songs. Quite the same may be true with Domenico Scarlatti. After making a name as a composer, conductor and harpsichord virtuoso he relocated to Lisbon where he did not only head the court orchestra, but also became Princess Maria Bárbara’s music teacher. When his student got married to the Spanish crown prince Fernando, Scarlatti followed her to Sevilla and Madrid. This move brought about far-reaching consequences on his work. He wrote more than five hundred sonatas, many of them apparently influenced by Moorish, Gipsy and Christian-Spanish music. “The folk element is constantly present throughout these works”(baroquemusic.org). Music of simple people and of three ethnic groups, melodies floating between minor and major keys, bolero and fandango rhythms. Béla Bartók is regarded as the pioneer of modern music ethnology. He studied and collected countless dances and songs from Hungary and its neighboring countries. As a researcher and composer Bartók explored the world of “peasant music” as he called those melodies respectfully, thus opposing composers like Franz Liszt or Johannes Brahms, who in Hungarian Rhapsody and Hungarian Dances romanticized Magyar music. Dealing with the musical expression of simple people, Bartók was convinced that regional forms of art could not be limited to a nationalist ideology as it was the case in many European countries. After his move to the USA he wrote: “My aim is the friendship of nations. All my efforts serve this purpose.” (quoted in: Belá Bartók Internationale Musikgesellschaft, belabartok.at). Like Scarlatti and Haydn, Bartók explored regional culture in order to compose world music respectively music for the world. The more they occupied themselves with these composers the more Marialena and the Palotians found out that the grandmasters’ music was a frank invitation to “cross-crossover” or “fusion-crossover” (if I may suggest this neologistic neologism). Scarlatti, Haydn and Bartók were not only familiar with the harpsichord, the piano and other “academic” instruments, but also with the bagpipe, the hurdy-gurdy, the guitar or the reed pipe. So it was obvious that the quintet decided to combine Marialena’s piano with Hotel Palindrone’s large pool of instruments to explore sounds and rhythms which might irritate some classical music aficionados and pop fans, but which were taken for granted by contemporary musicians and listeners. Consequently, “crossing crossover” makes sense. That way the quintet acquired a program which lives up to this double musical acculturation. A process leading to a new experiment: A passage to India. Marialena’s family comes from Goa and her name refers to five hundred years of Indian-European history. Which is not only reflected in the architecture on the western coast of India, but also in clothing, cuisine, language and music. Mandos, dulpods and dekhnis: “East meets West – not as a clash, but as a fusion. Not in dischord, but in harmony” (Alfred Braganca). Fado, counter dance, quadrille, waltz and polka spread quickly all over the Portuguese colonies, also among the native population. This music was to reach its climax in the 19th and 20th centuries. In February 2015 the band’s Goan repertoire had to stand the test on site, respectively in the lion’s den, when they went on tour in India: Within twelve days ten concerts and three workshops. In Mumbai and Bangalore, as well as in the Konkani-strongholds Mangalore and Goa. They stood the test – and the enthusiastic reception convinced the musicians that it was time for an album. For the CD Tambdde Roza Marialena Fernandes chose the probably most popular Goan songs. Melodies sung in Konkani, a language spoken by about ten million people from Mumbai to Mangalore. You can hear these tunes everywhere – in the streets, at shops, at simple taverns and chic clubs. You will catch any imaginable kind of interpretation: from the original instrumentation with the violin, the guitar and the Ghumot-drum to rock-versions and pop-songs à la Bollywood. Tambdde Roza Tuje Pola and Adeus Korchu are mandos, which usually deal with sublime feelings. In this case with love (Your cheeks are as red as roses) and wrench due to leaving home in order to get married (It’s time to say farewell). The mando rhythm caused some controversy among scholars, above all if you listen to this music the “European” or “academic” way. Three-four or six-four? In her dissertation Marialena writes that most singers and instrumentalists do not care about bars and rhythmical rules. They rather trust their ears and feelings to merge melody and rhythm. A philosophy of making music which perfectly suits Hotel Palindrone’s way of playing. While the mando, just like the Portuguese fado, mirrors the romantic and sentimental Goan soul, the dulpod describes down-to-earth reality. It depicts the worries and joys of everyday life. Its swinging six-eight time inspires people not only to sing along but to dance. The samples on this album contain all necessary ingredients: Irony, mockery, coquetry and screwball humour. In Cecilia Mhojem Mhojem Naum (Cecilia is my name) a clever girl would not be easily impressed by the charm of an enamoured man although she likes him. The following Undra Mujea Mama (You rat, my uncle) narrates the bizarre encounter of rodents and cats. In Sanskrit dekhni means “satanic and decoying beauty”. In Konkani a bit less ambiguously it just implies “enchanting beauty”. This two-four time dancing song seemingly represents the cultural ties between the Hindu hinterland and the Portuguese-catholic coastal regions of Goa. The Hindu areas were shrouded in legends and secrets, they were a projection screen of hidden desires, a bewitched sehnsuchtsort – and thus an inspiration for music. In a similar way, thanks to Goethe, Sterne & Co Italy became the sentimental getaway for Europeans. The same might be true with Mexico that turned (for many US-Americans) into an enigmatic emotional utopia. This also applies to the whole Indian subcontinent which, maybe incited by the Beatles, became a spiritual land of plenty. In the Konkani regions the phrase “on the other side of the river” can be heard frequently, a metaphor on an attractive but also hazardous world. Far away and nearby at the same time. Accordingly the most popular dekhni is called Saiba Poltoddi Vetam (I’m crossing the river). This song achieved eminence all over India when it popped up in a Bollywood film. A group of young women wants to join a wedding, but they have to persuade the ferryman who is quite fond of the ladies (and vice versa) and therefor tantalizes them. The story is continued in Ghe Ghe Ghe (Take, take, take): Even offering flowers or jewels would not convince the man – only promising a kiss can prompt him to pick up the oar. When compiling this album it was pretty hard to opt for tunes out of the quintet’s extensive repertoire of traditional European folk music or their original compositions. In the end the musicians decided on dances from Sweden and Austria. An archaic Kruspolka with a sinister and cunning melody rolling steadily in a tricky dance-floor rhythm. Sounds a bit like describing a Bartók folk dance. The Schleunige Tänze from the Schmalnauer Collection come the alpine Salzkammergut region. They are characterized by a Lydian scale that might have delighted Domenico Scarlatti or Carlos Eugenio Ferreira. Classical music, folk, jazz, ethno, world music? It is impossible to fit Marialena Fernandes’ and Hotel Palindrone’s music into any single genre. But they use a language which – hopefully as defined by Joseph Haydn – is understood by everyone who is willing to go beyond borders and search something new. 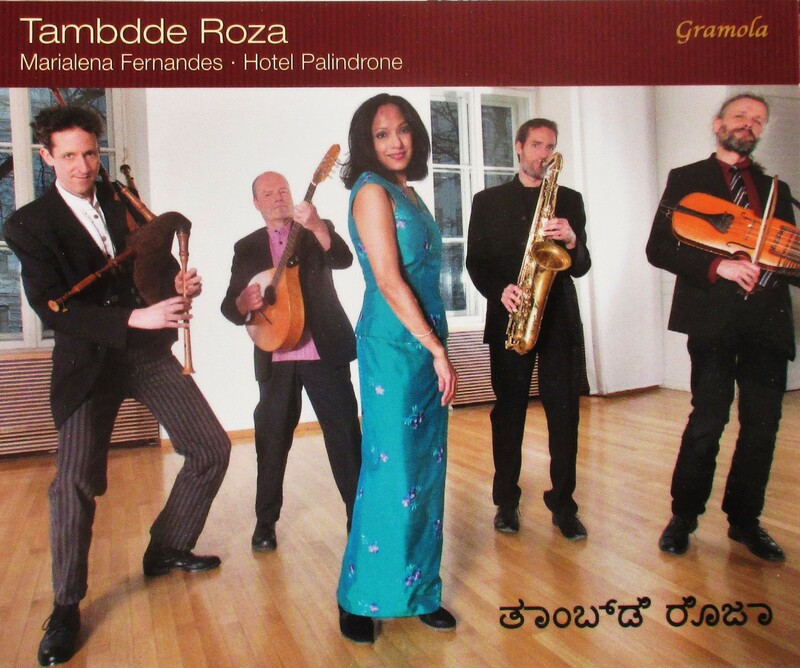 Radio Klassik Vienna: "Tambdde Roza" CD of the week! “I did not know that Marialena Fernandes is such an enchanting singer. To parts of the Indian population ‘Mando’ means the same as ‘Fado’ to the Portuguese. These tunes express poignant love and other great feelings. But as soon as the listener has dried tears Béla Bartok’s ‘Microcosmos’ pops up – a swift voyage from Goa to Bulgaria. When Marialena Fernandes intones the probably most popular ‘Dekhni’, a dance song, you just have to close your eyes and you will fly to Bollywood. Of course the musicians do not neglect classical music: and Joseph Haydn and Domenico Scarlatti are performed with airiness and nonchalance. ‘Tambdde Roza’ means ‘your cheeks are like red roses’ – and this project is catching, because it goes beyond borders and the musicians are unprejudiced. I love being a guest at this hotel and I appreciate having a bit on this side. What had started as an industrial mill in 1921 was turned into a multi-faceted arts center fifteen years ago. 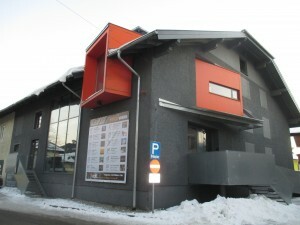 Situated in the Lake District to the north of Salzburg the Kunstbox has become more than a regional player when it is about theatre, dance, exhibitions and music. Furthermore it strongly focusses on literature (granting scholarships to young authors and linguistic studies at Haus der Sprache (House of Languages).